Gene Hernandez y Su Salsa Clásica - "El Cubanazo"
Gene Hernandez premiered his new single "El Cubanazo" at the 2nd Annual Miami REUNION DE LOS CHARANGUEROS Sunday, August 1st, 2010. 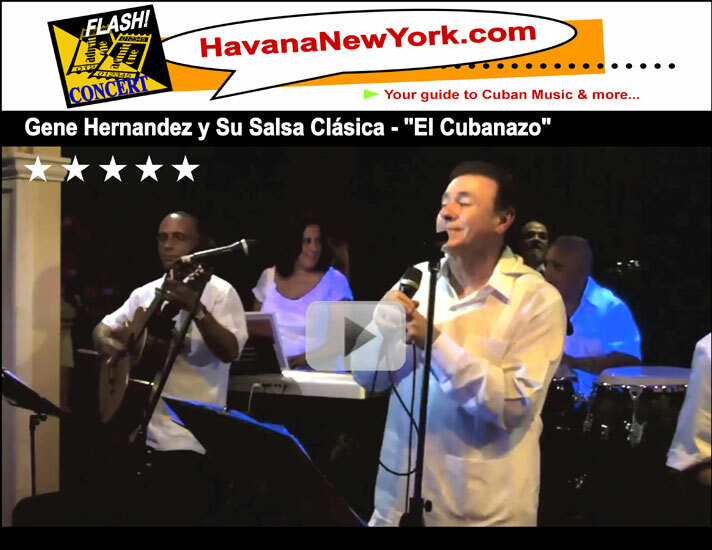 "It`s been a long time since 'Isla del Encanto' with Orquesta Broadway and 'El Sabor de Gene' with Fania and now 'El Cubanazo,' a single release by Gene Hernandez y Su Salsa Clásica. It`s the story of a nostalgic figure that is a master of all trades; If you are Cuban it will touch your heart, and if you are not, it will make you dance till you drop... It`s 'Cuban Pete' all over again." Gene Hernandez, singer, composer and experienced musician, has been able to combine his talent, musical expertise and personality with his feelings for his heritage and country in this composition. In this release, "a single for collectors," Gene explains the whys and wherefores of that transcendental person of the Cuban Exile, that although dispersed throughout the world, sets his roots in Miami. Gene Hernandez, though, sets his roots in New York. Gene, already known for his composition "Isla del Encanto" which he recorded and interpreted with Orquesta Broadway in New York in the 80's, has been recorded by many other artists, such as Gilberto Santa Rosa, La Orquesta Aragón, Hector La Voz, Nestor Torres, among others. Gene experimented with his musical aptitudes at a very early age in the City of New York. He joined "Típica Novel" where he expanded his musical talents and began to gain the experience and maturity that can only be gained by performing with the best musicians in New York. His musical curiosity led him to sing, where he became known for his musical tone and harmony with "Typical Novel" and later with "Orquesta Broadway." His style and voice led him to become an exclusive artist for Fania Records, where he recorded may LP's with orquestra "Novedades" together with the musical arranger and trumpet player, Luis Perico Ortiz. He continued his musical career and became known as a vocalist and soloist, and performed with another orchestra, very well known at that time, "Charanga 76" with which he performed for some time. "El Cubanazo," we are assured will provide you with the ultimate experience and enjoyment in listening to the lyrics and simple harmony of this composition, which has the typical flavor that Gene has accomplished in this recording. Gene composed this wonderful composition together with his close friend Mike Garcia. To buy a hard copy of the Collector's Edition CD Single "El Cubanazo" for just $4.99, e-mail Gene at cejak1@att.net or Mike at egarcia210@comcast.net.